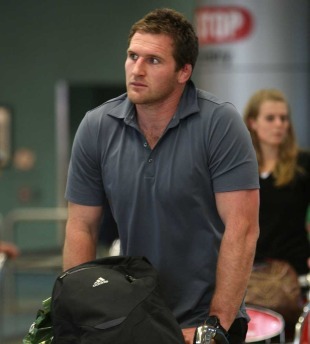 All Blacks No.8 Kieran Read is anticipating being back in action by the end of January after suffering knee ligament damage in their Grand Slam-clinching win over Wales on Saturday. The back-rower is hopeful of being ready for pre-season with the Crusaders prior to next year's Super Rugby campaign. "I'll probably work back in with the Crusaders in late-January and a couple more games under my belt before then," he told Sportal. New Zealand coach Graham Henry is gearing up for a few weeks of rest and relaxation following a taxing season but he will soon turn his attention to the schedules of his players in Rugby World Cup year. On December 12 Henry will meet with the coaches of New Zealand's five Super rugby franchises in Wellington to discuss how best to manage the workload of his key personnel. "Our biggest challenge is the players have to be reasonably sharp mentally coming into the Tri-Nations and World Cup," he said. "If they're buggered it's going to very difficult. We're working on a calendar at the moment on when we're going to be at the franchises, what games we're going to watch." All Blacks skipper Richie McCaw may sit out the opening rounds of the Super Rugby season for the Crusaders while star fly-half Dan Carter is also likely to take time out as he continues his recovery from ankle surgery. Henry and his assistants, Steve Hansen and Wayne Smith, will visit the franchises about three times during the season. Regional coaches will also be party to discussions Henry and his team have with World Cup contenders - talks designed to improve an individual's performance. "We want the Super 15 coaches at the meetings when we have one on ones so it's transparent," Henry said. "We'll talk to the players about their game, talk about how the game is developing and pass on information if we see trends developing."